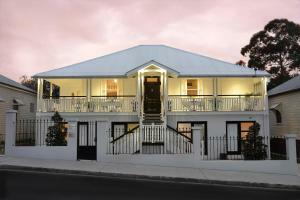 Just 10 minutes’ drive from Brisbane City Centre, Heal House offers elegant suites with luxury amenities and free WiFi. Guests can relax on the spacious terrace, while enjoying the picturesque gardens. Guests enjoy free continental breakfast. Heal House is located in a quiet leafy suburb just 4 minutes’ drive from Brisbane Powerhouse. It is within 10 minutes’ drive of a range of shopping and dining options. Brisbane Airport is 20 minutes’ drive away. All suites are air-conditioned and offer a flat-screen TV with 70 free channels and a free non-alcoholic minibar. Each suite features a private en suite bathroom with granite tiles, custom vanities and free luxury toiletries. All rooms are serviced daily. Guests have access to a shared lounge area and a dining alcove. Limited overnight off-street parking is available for small and medium cars. Cooked breakfast is available for an additional charge. Important Information: Please note that limited overnight onsite parking is offered subject to availability upon arrival. Please note that payment is via Visa, Mastercard or American Express credit card only. Please note that there is a 3.05\% charge when you pay with an American Express credit card. Please note that access to Heal House is via a set of stairs. Due to the heritage nature of the property, there are no wheel-chair facilities. Late check in may be available upon prior request. For further information please contact the property in advance, using the contact details found on the booking confirmation. Please inform Heal House in advance of your expected arrival time. You can use the Special Requests box when booking, or contact the property directly with the contact details provided in your confirmation.